A few month's ago we had a team meeting about venturing into some new types of racing. The 1/2 mile & 1 mile racing events most commonly held in Texas popped up and we decided it might be a good idea to take a stab at them. Little did we know it was going to fall into out lap faster than expected. Fast forward to a week ago, and our resident tuner, Elliot, was reviewing the logs of Rob Dahm's 3 rotor FD the night before his dyno session. We wanted to ensure things would go smoothly on Rob's newly installed Adaptronic Modular ECU. A fuel pressure problem was noticed, and a flight was booked that night to help sort out the car. 17 hours later the car was strapped on the dyno, and we didn't know what to expect. We knew Rob wanted to make the SpeedFest 1/2 mile race that weekend, but first the car had to not only survive the dyno session, but make enough power to make the event worthwhile. Keep in mind the engine was rebuilt 8 years ago by JPR imports, and its only modifications were a large street-port. Its basically an OEM D code block. On the first pull the car over boosted and hit the ecu's over-boost protection setting. We noticed the waste-gates and the 4 port solenoid were plumbed wrong and had to be reconfigured. Moving forward we noticed the car still had a fuel pressure issue, even after a new regulator was installed. It turns out one of the fuel pumps was dead. Luckily the shop had a new walbro 460lph in stock, and we put that in. 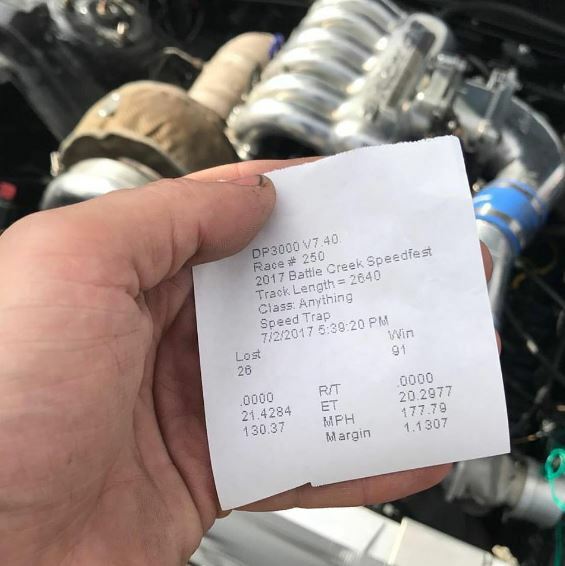 The car ended up making 611rwhp at 13.9 psi on pump 93. We did raise the boost and it made 666rwhp at a really rich afr. We decided to call it quits on pump gas and added the c12( 108 octane) race gas. A few more pulls and we noticed the OEM 9s were not up to task, luckily we brought some of the NGK race plugs with us. A few more pulls, and some time spent adjusting the timing & fuel maps yielded 835rwhp @ 25 psi. By this time we had run out of race fuel, and the dyno brake was overheating. It was 2AM, and we figured we better call it a night. The following day Rob picked up a used OEM 5 speed transmission from Canada, and we installed it that night, along with cleaning up as many things as possible on the car mechanically. The following day we got some fresh tires mounted and the car balance. It was the first day of racing at the airport and we took off to the event. On the way there we hit a chunk of asphalt and it split the front bumper in half, smashed the radiator and killed the car electronically. We diagnosed some bare wires from the previous owners wire tuck under the fenders. We spent the next day fixing these issues, and checking the pump gas tune under real world conditions on the street. 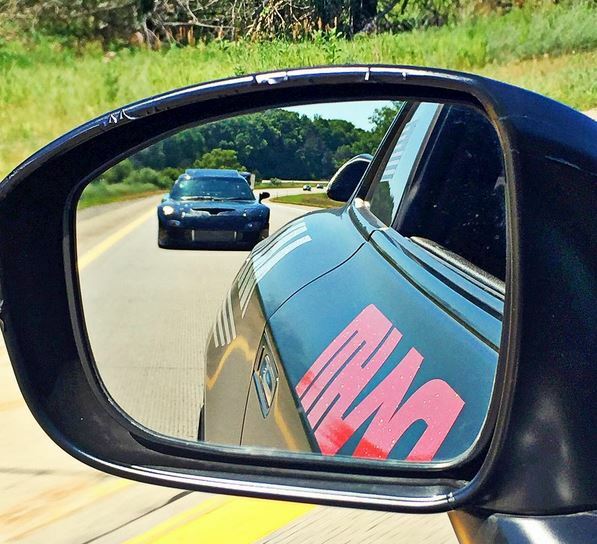 That Sunday we finally made it to Battle Creek for the 1/2 mile race after a 120 mile drive. We didn't have a chance to check the tune on the race gas, and to make matters worse we only had access to C16. The car was never tuned on C16, and we didn't know exactly how the boost controller was going to react on the road. 4 port controllers are very sensitive, and dynos never load the engine like driving on the road. We decided to make the first shake down pass at spring pressure only( 10 psi). Rob was going to take it easy and see how it felt at speed. It was pretty nerve racking as the car lined up and prepared to make its first pass. We were overly concerned with how well the radiator patch would work, and if the car would overheat at extended WOT. Keep in mind 20B engines tax the cooling system heavily, and this car has a front mount intercooler blocking the radiator, and only OEM R1 oil coolers. Luckily everything went smoothly and the car did 161mph. We were suppose to have about a 1/2 hour between passes, which should have given us plenty of time to review logs and make adjustments. Well as expected we only had about 5 minutes, and had to use the tablet dash to view the logs. The temps and tune looked clean, so we decided to raise the boost. The plan was to shoot for 20 psi, and on our last pass try the 25 psi setting. 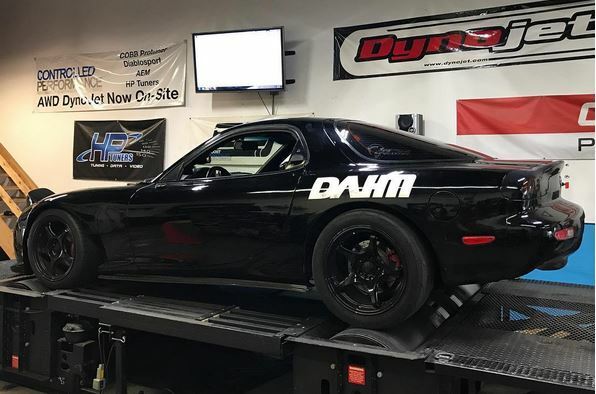 The combination of Rob's input on how good the car felt, how fast it went at low boost, and the excitement of the being close to a possible record, we said screw it and raised the duty cycle within 2 points of what it was on the dyno. We got to the line and they announced this would be the last run as a storm was approaching. Our hearts were definitely pounding as Rob took off down the airstrip. We were well aware that there have been a lot of attempts to beat the previous record of 174MPH, but all the cars suffered engine failures. We didn't have anywhere near as much prep time as desired, but it all paid off. The car went 177.8mph without a single hiccup at only 22psi. After celebrating the record with an unhurt engine, we reviewed the logs and noticed he was only at 80 percent throttle. The car has a lot left in it, especially with headroom for another 12 psi +/_. Another dyno session, and 2nd attempt at the 1/2 mile are in the works.